The I-405 has its haters. Heading east on the I-10 in the evening can wreck a marriage. 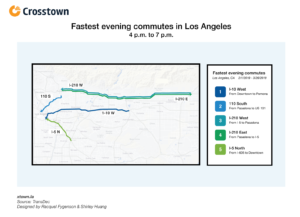 But there is one Los Angeles commute that is slower than all others: The I-5, heading south from Downtown in the evening. 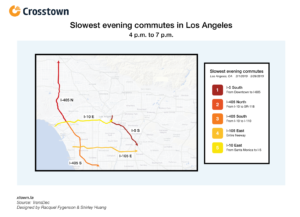 Traffic on that route moves at an average of 21.5 mph during the 4 p.m. – 7 p.m. rush hour, coming in dead last among the 26 LA freeway commutes we monitored. Beyond that, it’s also slower than any morning commute in Los Angeles County. And it seems to be getting worse. In 2017, the average was 23.2 mph. Before he took his current job, he worked eight minutes from his house. Now, to avoid the 5, he works remotely most days. What makes that commute even more emotionally painful is that the evening rush hour headed north on that section of the 5 travels at 60.2 mph on average, almost three times as fast. “You’re not moving going south and then they are just flying, going the speed limit in the other direction,” Foster said. Los Angeles famously holds the title of the global city where drivers spend the most time stuck in congestion, at 102 hours per year, according to the Global Traffic Scorecard published by transportation software firm INRIX. 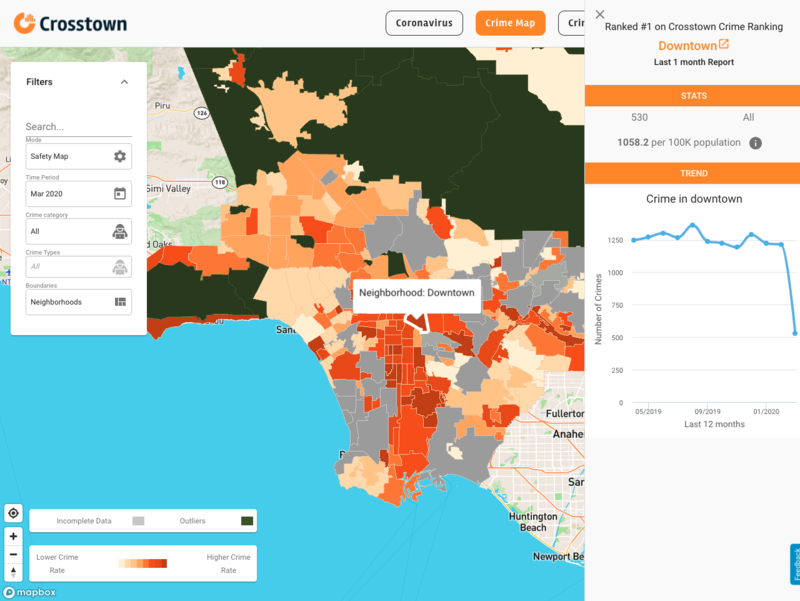 In order to figure out where and when gridlock is the most severe, we examined every major freeway across Los Angeles County from Feb. 1 through March 25, 2019. We grouped freeway segments by morning rush hour (from 7 a.m. to 9 a.m.) and evening rush hour (from 4 p.m. to 7 p.m.) and sorted them from slowest to fastest. A segment is defined as a section of a freeway that carries commuters toward a major destination, such as Downtown Los Angeles. For example, we divided the 5 into one section that stretches from the San Fernando Valley to Downtown, and another section the moves south from Downtown toward Orange County. Though the 5 may be the slowest, the 405 is not far behind. The evening commute heading north on the 405 from where it crosses the 10 toward Granada Hills took second place, at 27.5 mph on average. And the 405 heading south from the 10 toward where it crosses with the 405 in Gardena came in third, at 28.8 mph. The fastest evening commute? 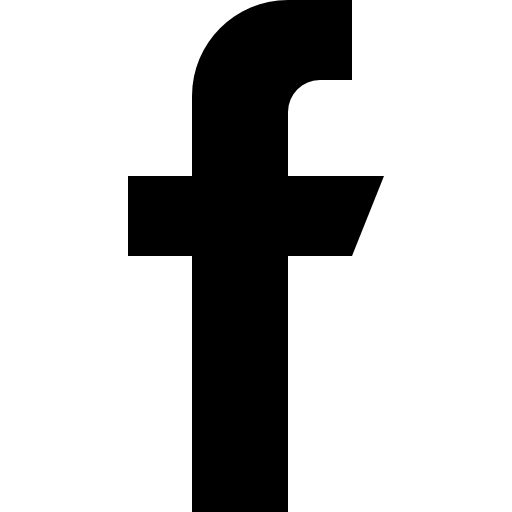 Probably not the one you take. You might think that people who work in Claremont and live in Downtown LA have a brutal route at the end of their work day. But the 10 freeway from Claremont heading into Downtown is the fastest evening commute in the county, with average speeds at 65.2 mph (which is also technically above the speed limit). Those who live near Downtown and work in Pasadena don’t have it so bad, either. Traveling south on that stretch of the 110 in the evening is generally a breeze, with average speeds of 61.4 mph. Wondering what an average evening commute might be? In LA, that means you’re moving at 44.6 mph. Anything slower and you have a right to complain. How we did it: We divided freeways into 26 different evening commutes across Los Angeles County. 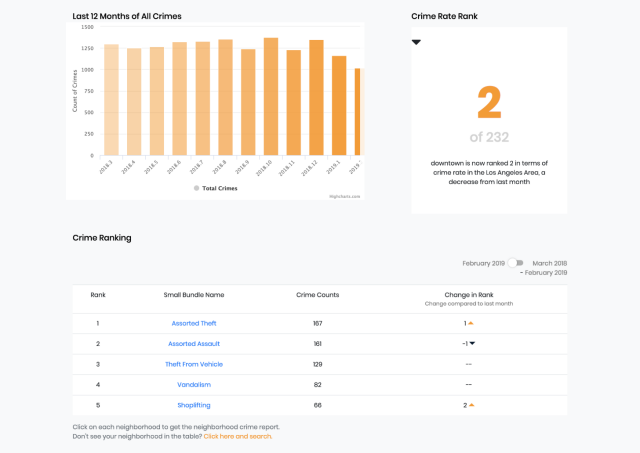 Then, we analyzed the average speeds on those freeway segments between Feb. 1 and March 25, 2019, by hour of the day and then by day of the week. We then calculated the average speeds during the peak of the evening rush hour (4 p.m. – 7 p.m.). 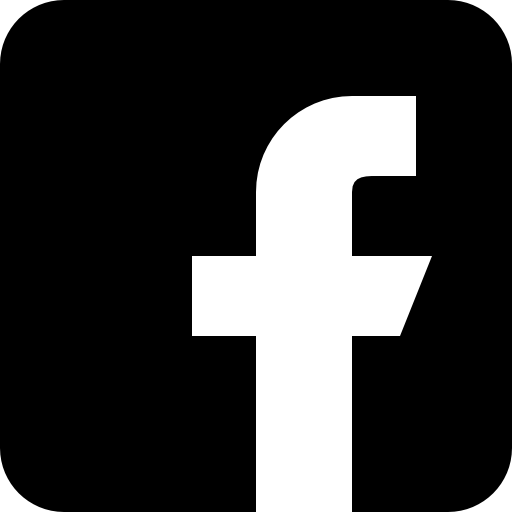 Learn more about how Crosstown compiles its traffic data here.